Speaking with Niccolò Mazzei, son of the president of Italian uber brand Edra, is an enlightening experience. Edra produces outstanding products that stretch the boundaries of furniture and along the way cajole us to explore our own perceptions of shape and form. For anyone who has attempted the pilgrimage to Milan for the annual Salone del Mobile, the experience is always a magical one. The city is alive with design and the exhibition centre of Rho is a sensory overload of products, colour and people. With a visit to Rho comes the difficult decision of which pavilions and brands to visit, and one of the must-see exhibits is always Edra, the stand that has a taste for the dramatic, an electric atmosphere and products that are showstopping in presentation. Since establishment in 1987, Edra has been at the forefront of furniture design, collaborating with some of the most highly respected designers of our time, and the story of the company is one that combines architecture, science and poetry. Edra has shown an innate ability to retail imaginative and creative designs and so its products are renowned as avant- garde by pushing the boundaries in every direction. Niccolò Mazzei is the son of Valerio Mazzei, president of Edra, and is the director of international development for the company. Born into the Edra family, he lives and breathes the brand that is still, 31 years later, a family owned business. 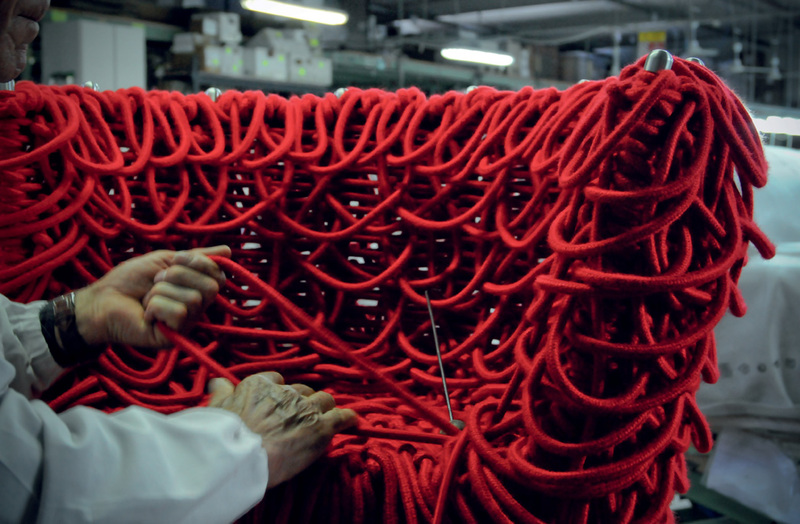 Take, for example, the Campana brothers, Humberto and Fernando. Edra saw the genius of their talent and worked with them to make the designers’ visions a reality. 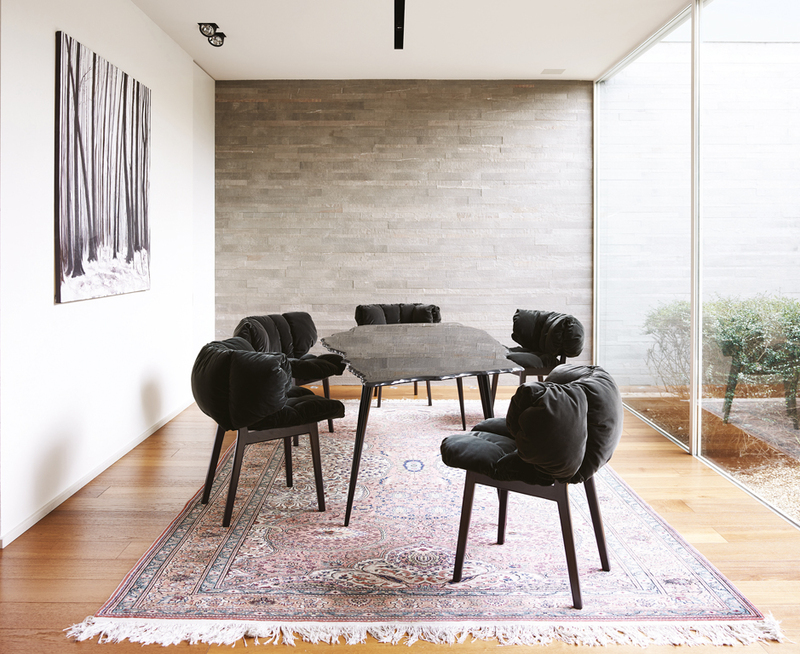 With the Corallo or Favela chairs, made from twisted wire and a zigzag of wooden slats respectively, the materiality and construction are undeniably particular, and the designs sit somewhere between a gallery sculpture and retail showroom. Edra harnessed the unusual and made the Campana designs a reality and now they are viewed as outstanding representations of both designer and brand. It is not, however, only the very unusual design that attracts Edra. The business has been at the very cutting edge of innovation with furniture that leads by research and technology. Francesco Binfaré, for example, has collaborated with the brand for decades, creating some of the most creative and challenging designs such as the Flap and the Standard sofas. To accommodate the design of these products Edra developed its own special foam ‘smart cushions’ and engineered backs and arms that could bend and twist. These technologies were ahead of their time and to this day are widely imitated. Another outstanding design is Mario Cananzi and Roberto Semprini’s Tatlin, where again the engineering involved was intricate as the sofa appears as a floating, imposing sculpture that translates to a circular seat. Producing a form is one thing, but creating the correct fabric to enhance form and function makes what may be an interesting product outstanding. Fabrics are developed in tandem with product structure and make the ultimate difference, and Francesco Binfaré’s Pack sofa is a fine example. 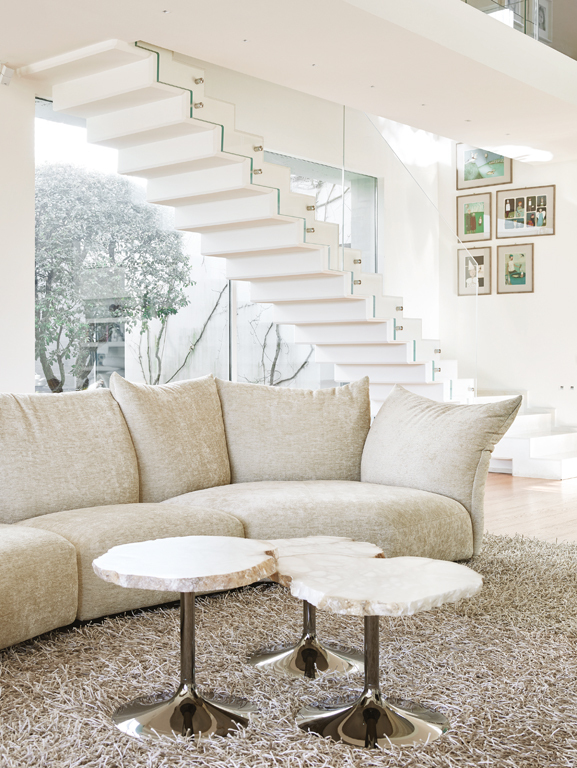 The sofa seat resembles two glaciers and the undulating backrest has been fashioned to loosely resemble a polar bear. This is not your traditional sofa, but the form has function and coupled with extraordinary style is unique. Edra is a powerhouse of design, so, what was it like to grow up in a family business that celebrates products such as Edra’s? Mazzei explains that for him it is normal. 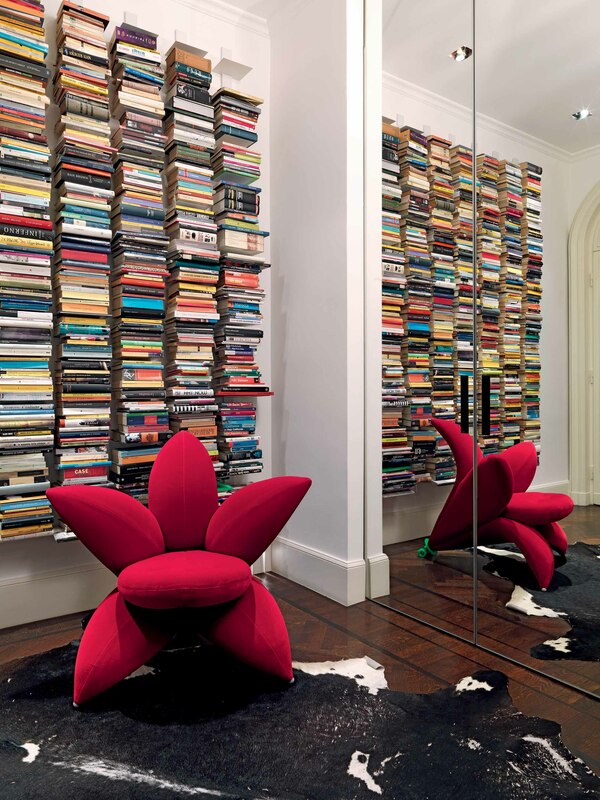 He grew up surrounded by extraordinary furniture and meeting important designers and knows no other life. From school he worked with the company and has never left, remarking that there is nowhere else he would rather be. Developing new products takes time, sometimes many years, and Mazzei reinforces the idea that every new product needs to be perfected before it finally makes its way to the floor at the Edra exhibition at Rho for Salone and goes to market. Sometimes this involves inventing a new mechanism or process, and the research and development department is constantly busy. The company receives thousands of submissions each year from designers and architects, but only a very few are selected for further investigation. Sometimes the designer is known, other times not; however, it is always the idea that is the crucial starting point. For those travelling to Milan next year, Mazzei hints that there will be a launch of a rather special new product from Edra. If other collections are an indication this will be something to see. Salone del Mobile and Edra is quite a combination and we can’t wait to discover what is to be unveiled.